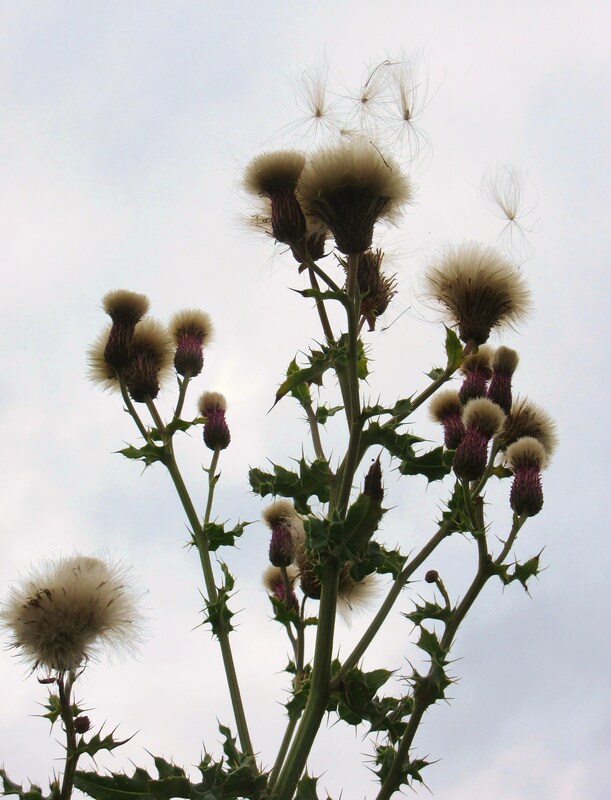 What do you see when you look at overblown thistles? Life? Death? I see life. The wind grasps each feathery seed and tumbles it into the air and away from the parent plant before dropping it on new ground. Not all of the wind-deposited seeds will grow into new thistles, but many will. Prickly purple thistle became the emblem of Scotland during the reign of Alexander III (1249-1286). Norway’s King Haakon led his army in a surprise night attack in an effort to conquer the Scots. The surprise attack failed after the Norsemen removed their footwear for stealth – and stood on thistles. Their shrieks of pain alerted the Scots – who won the battle – which in turn won a victory of reverence for the prickly plants. Vegetation produces blooms, then seeds. The blooms must die first to turn into seeds. The seeds must die before they can be planted and burst into new life. When trees fall in the forest, they decay and enrich the soil contributing to new life. The cycle of life and death repeats endlessly with death feeding new life. The greatest example of this is the life, death, and life of our Lord and Savior Jesus Christ. His death on the cross brought life and eternity down to earth for all of us because he rose again from the dead. He lives! Because Jesus lives, we will live again. Heralded by dying leaves falling off trees and flowers dying and drying into seed, Fall can make us melancholy unless we remember that death creates new life. Posted on October 1, 2015 by authorstephanieparkermckean •	This entry was posted in Uncategorized and tagged Bible, death, Fall, life, Scotland, seeds, thistles. Bookmark the permalink.